eReads - Who Pushed Humpty Dumpty? Explore: Who Pushed Humpty Dumpty? Preview - Who Pushed Humpty Dumpty? Break-in at the Three Bears family home? It could only be one dame. Wicked witch gone missing from her candied cottage? Hansel and Gretel claim it was self-defense. 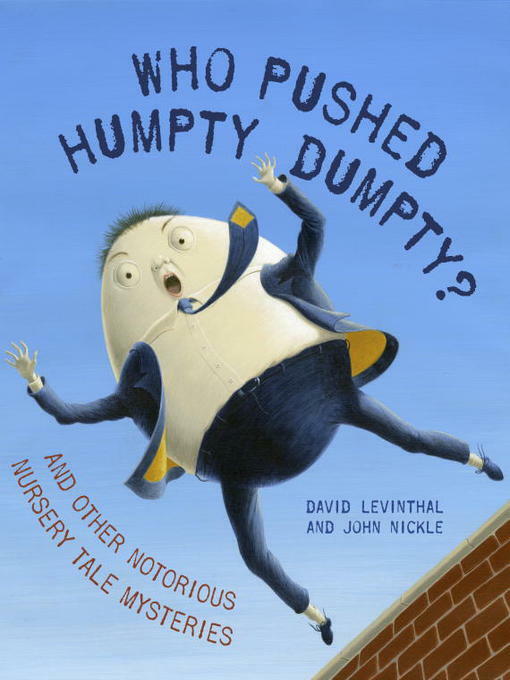 Did Humpty Dumpty really just fall off that wall, or was he pushed? Here are five fairy-tale stories with a twist, all told from the point of view of a streetwise police officer called Binky, who just happens to be a toad in a suit and a fedora. When Snow White doesn't make it to the beauty pageant, Officer Binky is the first to find the apple core lying by her bed. When an awful giant mysteriously crashes to the ground, upsetting the whole town, Binky discovers exactly who is responsible. Author David Levinthal and illustrator John Nickle retell these classic stories in the style of a 1940s noir detective novel--for kids!